In the fall of 1836 Elisha Edgerton and his wife Belinda came here in their wagon drawn by oxen. They cleared the land and built their farm home, with buildings recognized as a Wisconsin Premium Farm by the State Agricultural Society. Episcopal services were held in a small chapel over the carriage-house for early settlers of the surrounding area. In 1865 Edgerton sold the farm to inventor-manufacturer George Washington van Brunt who built the tall mansion in 1873 and made Premium Farm a show-place. After van Brunt’s death his children operated the farm as Springdale Resort but the popularity of resorts dependent upon springs soon waned. Ajalon Spring still provides water for the entire installation. 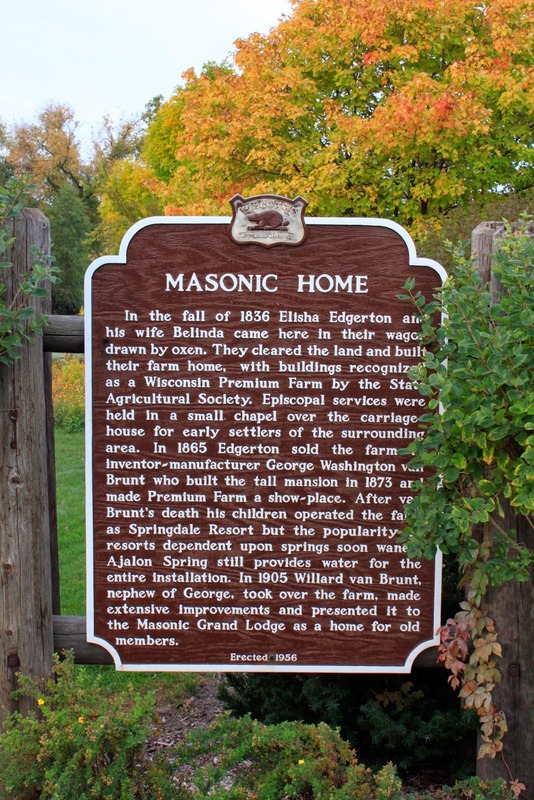 In 1905 Willard van Brunt, nephew of George, took over the farm, made extensive improvements and presented it to the Masonic Grand Lodge as a home for old members. The marker is located at an awkward highway turnout on eastbound Sunset Drive, / U.S. Highway 18, between North Main Street (to the west) and Summit Avenue / Wisconsin Highway 67, Dousman, Wisconsin 53118. The property is now home to Three Pillars Senior Living Communities. The marker is to the left of the building, hidden in the shrubbery. View from westbound Sunset Drive . . . The Masonic Home . . .